We went to meet a relative who had a baby boy 2 months ago. It was Betu's first rendezvous with a baby so young. He was quite small himself when Aryan was born so he doesn't remember that bit. So when we were going I was telling him how young the baby is and what he should not do since the baby is so small. It was really hard for him to believe that there can be a child who is not even 1 year old. He was asking me what all can he play with the baby and I was telling him the baby doesn't even sit right now. He cannot talk or walk or run. He was really amused and laughing as if I was telling all the wrong things. Or as if I was joking. But when he saw the baby he understood. He was trying to do things to make the baby smile. Clapping his hands. Brushing his hand on the baby''s forehead. Cooing with him. It was really cute to see him like this. Later on the way he told me "Mumma, Baby kitna cute tha na?" and I just smiled and nodded. Here is the pic of him holding the baby in the lap. Sorry the quality isn't great since its from phone and the lighting wasn't proper in the room and I was trying to take without flash. Anirudh looks really cute with the baby. 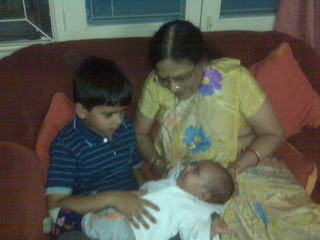 Ahem...proof that he can be a caring elder brother now...! wow! You have all the reasons to be proud of him. He's a smart boy for sure.